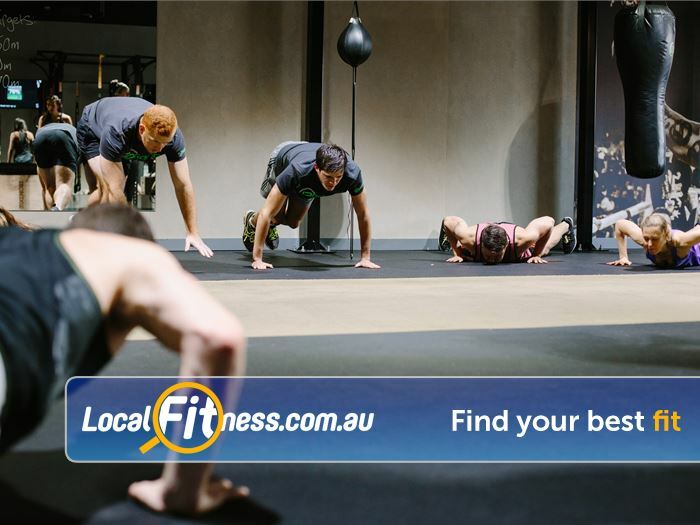 12 Round Fitness Gym Near Albert Park | South Melbourne HIIT Style Training Is a Great Way to Get in Shape Fast. 12 Round Fitness Gym Near Albert Park - South Melbourne HIIT style training is a great way to get in shape fast. South Melbourne HIIT Style Training Is a Great Way to Get in Shape Fast. Rethink your training with 12 Round Fitness South Melbourne gym! 12 Round Fitness South Melbourne gym provides High-Intensity Interval Training (HIIT) group based workouts designed by professional athletes and trainers to provide the ultimate ‘total body’ workout. Our workouts are designed around the format of a 12 round boxing contest and combine functional strength and cardio exercises with boxing skills and drills designed to trigger the “after burn effect” and leave you burning calories and fat for up to 16-38 hours post workout! With no set class times and no need to book in you can start within 3 minutes and be finished in 45! Workout when you want with a new round starting every 3 minutes - No lock-in contracts - burn 750+ calories - fast, fun & never boring - check out the video above and download a trial pass today!